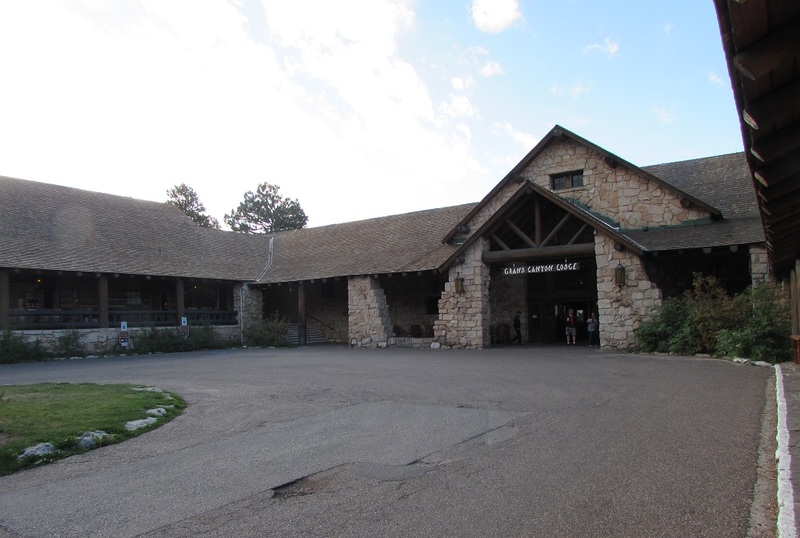 The entrance to the Grand Canyon Lodge at the North Rim isn’t particularly impressive. But once you step inside: POW! Just beyond the lobby is a great room with floor to ceiling windows. Look out those windows and it’ll seem like you’re hovering, groundless, above the canyon. The first hotel built in a US national park was the 1903 Old Faithful Inn in Wyoming’s Yellowstone National Park. It was designed, by a 29-year-old architect named Robert Reamer for the Yellowstone Park Company (an affiliate of the Northern Pacific Railroad), with a massive log lobby and stone fireplaces. The style would become known as National Park Rustic and the inn would become the template for dozens of other national park lodges across the west. I’ve already blogged about my Utah National Park trip hotel woes. I tried to get reservations at the lodge in Bryce. No luck. Then Zion. No luck. But then we made our way back into Arizona and bingo! 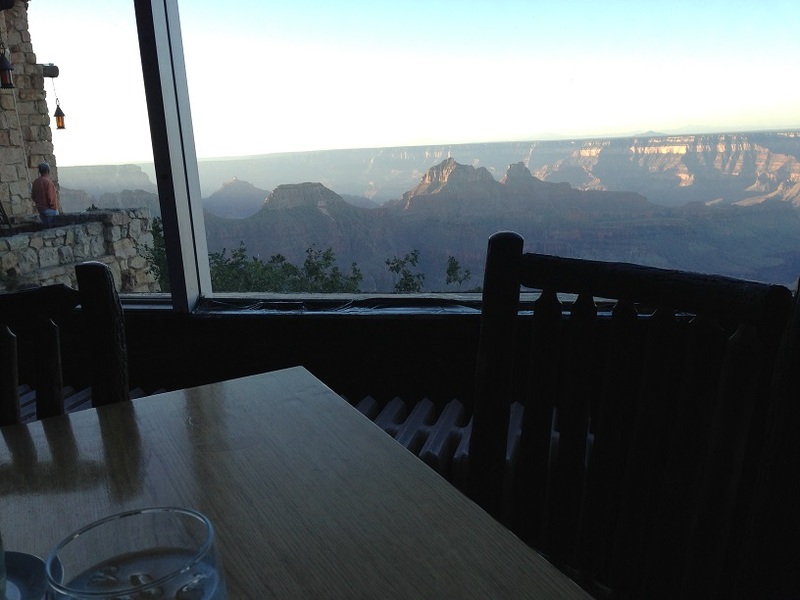 I managed to get a room at the Grand Canyon Lodge at the north rim. 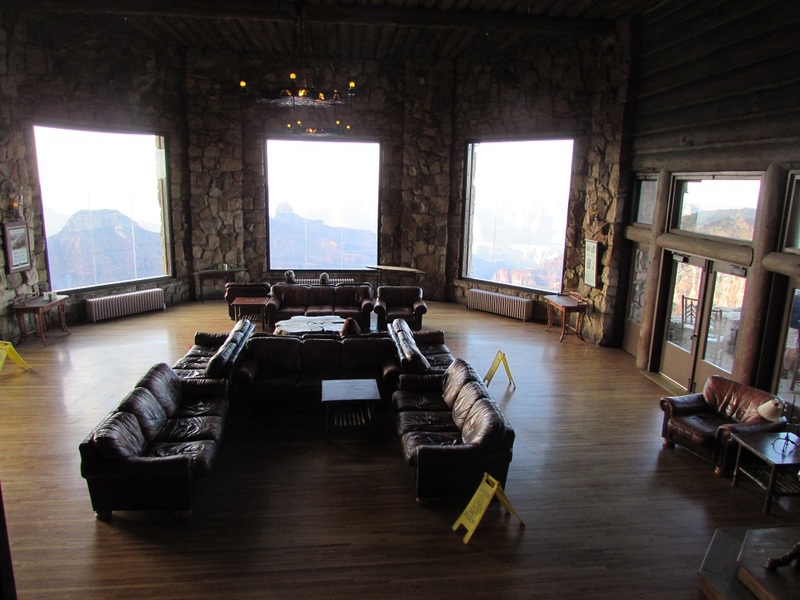 Good thing, too, because the Grand Canyon Lodge is the only concern going on the north rim. 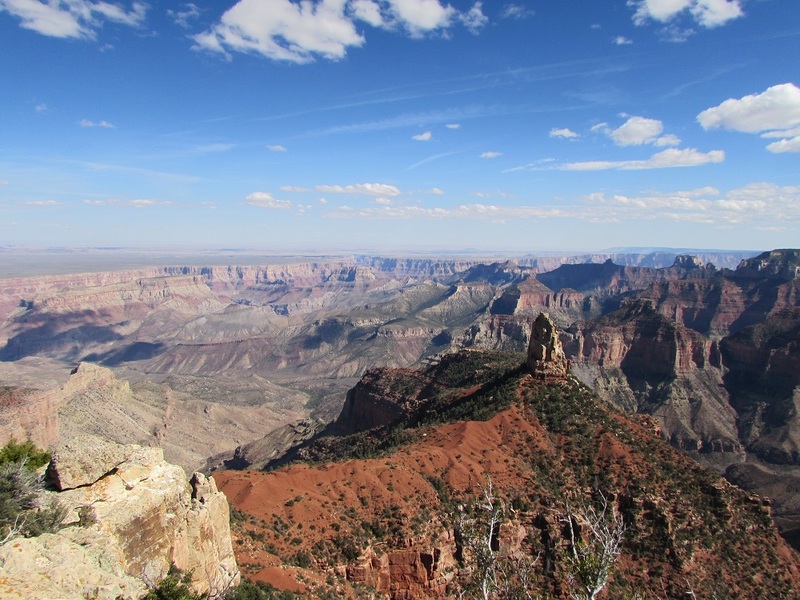 The next closest hotel is 18 miles from the rim, and that’s just one hotel. And there’s one more 45 miles away. It’s an 80 mile drive the first cluster of hotels, in Kanab. That’s the long way of saying: options are limited. The South Rim is the Grand Canyon that everyone knows. It’s the place with multiple Visitor Centers, hotels, restaurants, shops and attractions. It’s also linked closely with the rest of civilization. 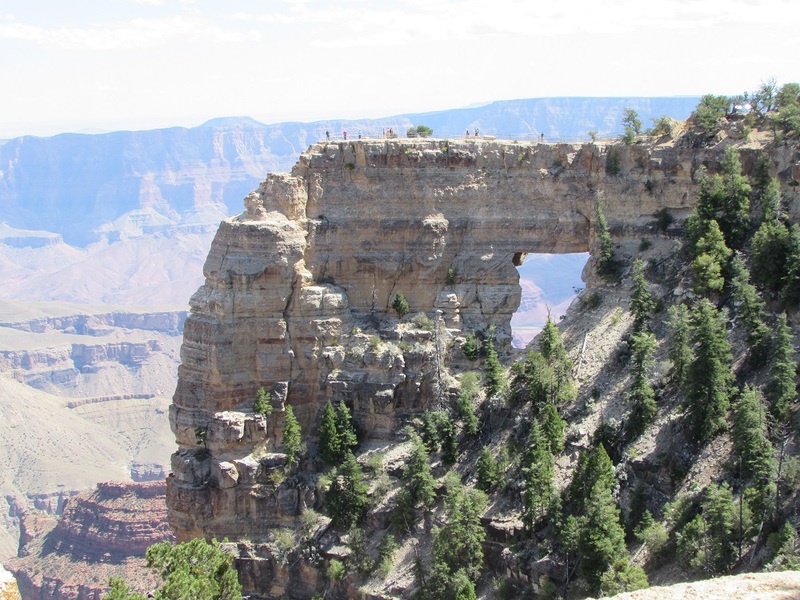 The North Rim is not linked to anything. That’s what makes it so appealing — the lack of amenities means that there are less visitors. Which may also account for why there were rooms available. It also means that there’s no choice of hotels. The Grand Canyon is a giant chasm in northern Arizona, carved into the earth by the Colorado River in a process that may have begun as early as 70 million years ago. It’s a mile deep, about 277 miles long and covers almost 2000 square miles. It’s not the largest canyon in the world, but it’s spectacular enough to be one of the Seven Wonders of the Natural World. The first humans went through the canyon about 10,000 years ago, and the Puebloan people have made it their home for slightly less than that. 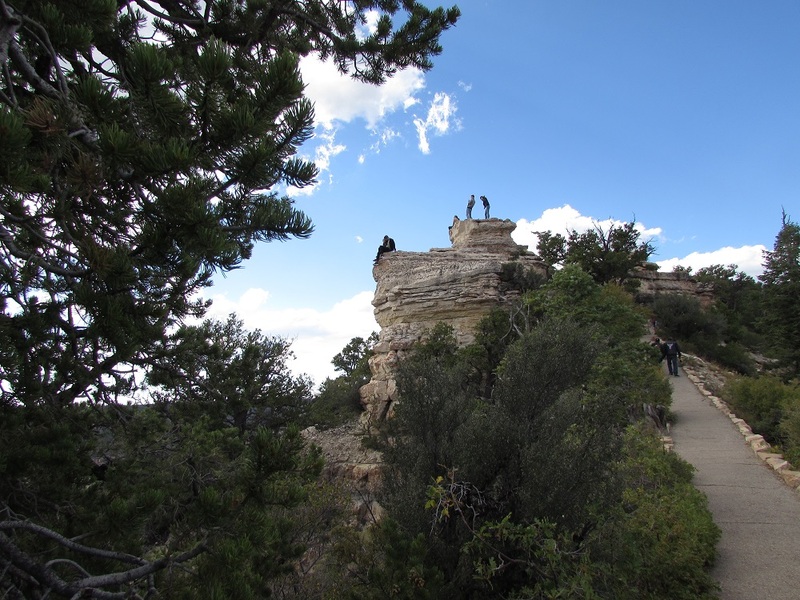 Spanish soldiers were the first Europeans to reach the canyon, in the 16th century, followed by a spattering of missionaries and adventurers through the next two centuries. In 1869, geologist John Wesley Powell became the first to purposely explore the canyon and record his findings, leading the way to tourism and development not long after. 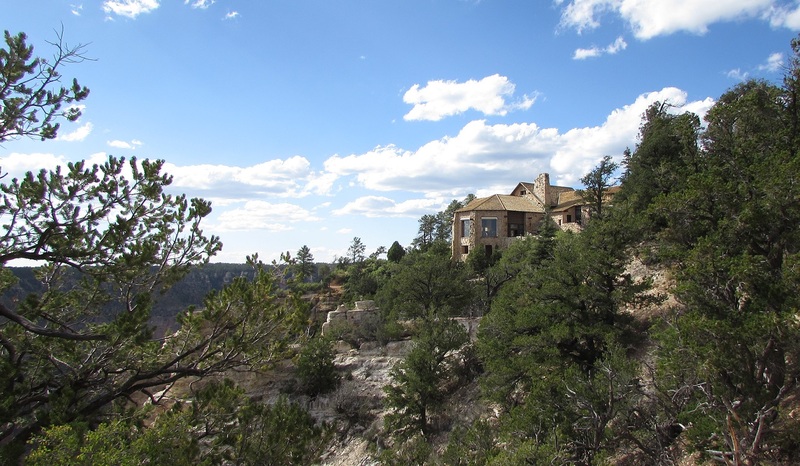 The circa 1928 Grand Canyon Lodge at the North Rim was built by architect Gilbert Stanley Underwood using local Kaibab limestone. 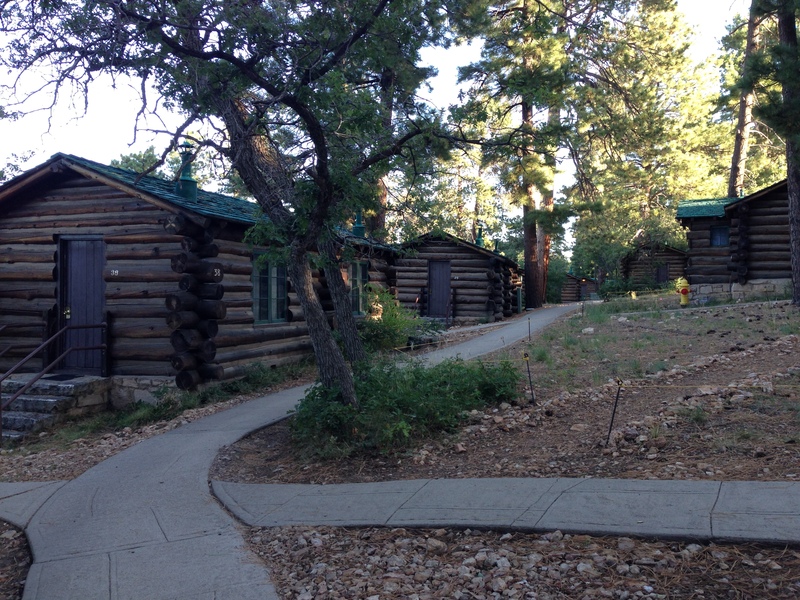 He also built 140 log cabins surrounding the lodge. Sadly, a fire destroyed the lodge and most of the cabins not long after they opened. The current structures are 1936 rebuilds, using some of the original stonework. The lodge became a National Historic Landmark in 1987. The main lodge itself has no guest room. It’s all public space. Guests stay in the cabins, or in a refurbished motel down the road. There’s also camping/RV sites, also down the road but within a reasonable walking distance of the lodge. 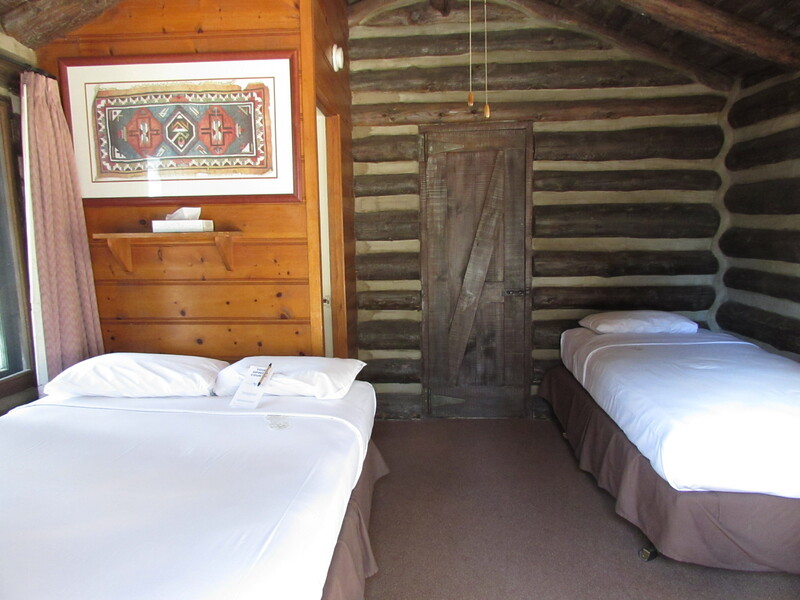 We were in one of the cabins which, like the lodge, are right on the edge of the rim. We weren’t in one of the first line rim-side cabins, but we were close enough for spectacular views and to be a few steps away from the start of several trails (the lodge has a shuttle that takes guests to more distant trail heads). 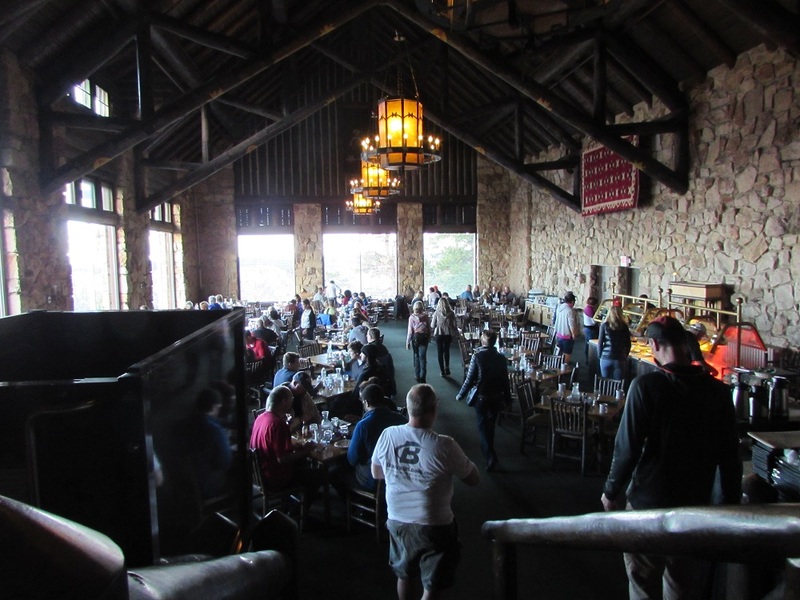 It was also a quick, few steps to meals at the main lodge. The views from the main dining room is pretty spectacular too. I thought that the cabin itself was simple, rustic and charming. My one complaint was that we were in a duplex and we could hear the people in the adjoining room so clearly that we wondered why the hotel had even bothered to put a wall between us. You’d think that log walls would be thick. Maybe it was the flimsy door between the rooms that were at fault. There are larger, single cabins. I don’t know if the interiors are any nicer, but they have porches with rocking chairs, and fire places. I can’t remember now if one wasn’t available at the time I made the reservation, or if I was just being cheap. Mr. History Tourist wasn’t charmed. He thought that the cabin was musty, dark and dingy. Mr. HT was also unhappy that there was no wifi in the park, except in the general store at the campgrounds. 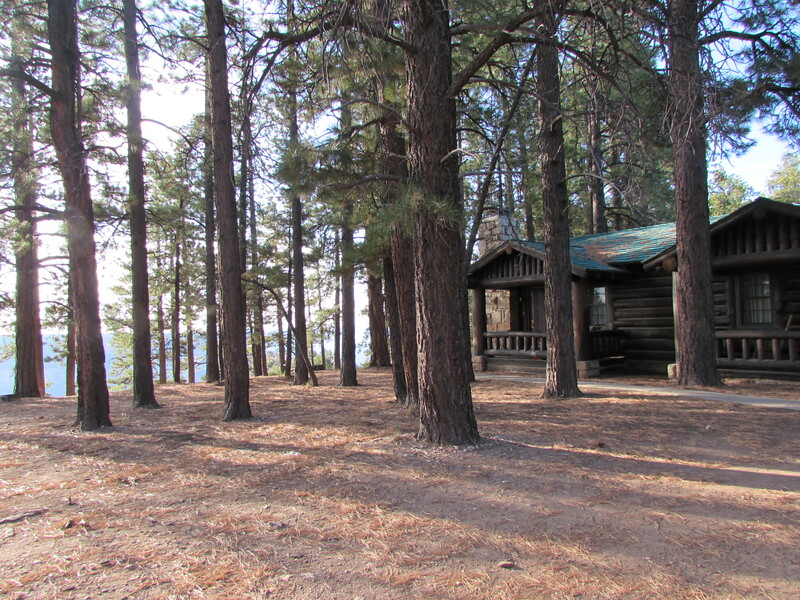 And no cell service, although we were told you could occasionally get something near the lodge, if you have Verizon. The “no cell service” thing had nothing to do with the hotel — there wasn’t cell service in any of the parks we’d visited and if we’d stayed at the lodges at Zion or Bryce, Mr. HT would have been equally bereft. I’m fine with being electronics-free for a few days, but Mr. HT likes his mod cons. I have a feeling that if we ever go back, we’ll be staying at a more distant but wired hotel. To stay there I could manage without WiFi. Great pictures. Thanks. His attachment to his electronics — you’d think that he was a teenager.